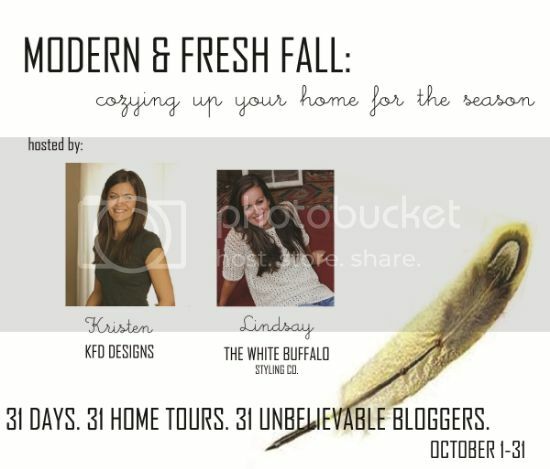 I'm excited to announce that Lindsay from the White Buffalo Styling Co. and I have organized a blogger home tour series, based on a "fresh and modern spin"on Fall. Some of my favorite, favorite bloggers are included, and I can't wait to see what they come up with! It's a super-long list of folks, 31, in fact (one for every day, the month of October), and I think it'll be so much fun to see what we all do. Lindsay and I asked people to think of fresh ideas - not your basic Fall decor - so hopefully you guys will be inspired, too. 1 – Lindsay and myself kick things off with tours on each of our blogs. Tuesday kicks off the start of the series. Have a great weekend! What a great idea! Look forward to seeing your style-y fall! Such a great idea. Was just talking about doing something like this with a blogger friend today! !